← “I wouldn’t say that!” He replied hotly. Science fiction doesn’t seem to like Christmas. Very few sci-fi shows have a Christmas episode, and many make a point of saying the ritual will be phased out. Even Star Trek, with it’s optimistic view of the future, has little to say about Christmas. 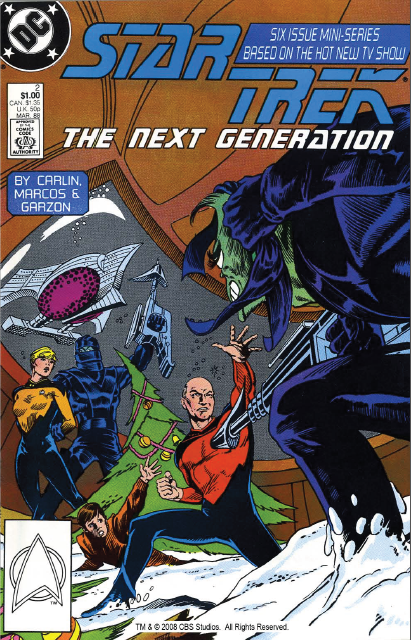 This is Issue #2 of DC’s Star Trek: The Next Generation 6 issue mini-series (launched before their 80 issue second run). 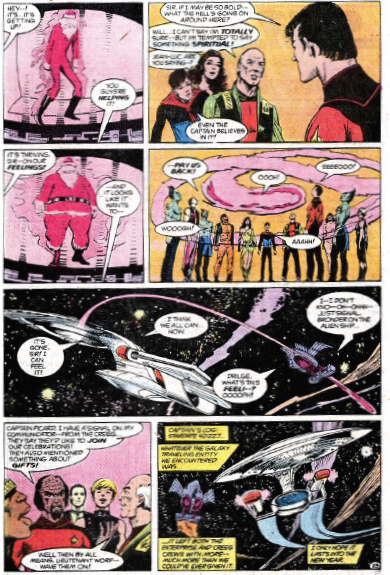 This is literally the second ST:TNG comic ever! Tasha Yar is still alive and kicking, Riker is beardless, and Picard has really been working out. The crew of the Enterprise is taking some much needed time to party when they are attacked by a mysterious entity. Could it be…? But attacks from men in red suits aren’t enough to dampen our crew’s Christmas spirit. Not when they’ve got a room full of real artificial snow, Christmas trees, and is that mistletoe? In case you can’t tell, Crusher kissed Data and Troi kissed Geordi. Oh, yeah … that happened. Anyway, turns out Santa gets around and a mysterious alien ship invades the Enterprise trying to hunt him down. At first they appear hostile, but believe it or not they’re actually trying to help the big guy, by showing him some love. 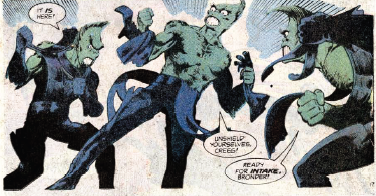 And yes, they look like the Grinch, who also has been working out. They’re clad in black leather, and strip down to their waists in order to take Santa into themselves in order to rejuvenate the entity. Big guy’s looking a little thin. But thanks to the love of the crew of the Enterprise, he’s looking a little jollier in no time. And then it’s time for more presents and partying. Even Worf’s excited! Now all we need is a Shatner-esque reading of The Night Before Christmas. Merry Christmas everyone! See you next Wednesday! 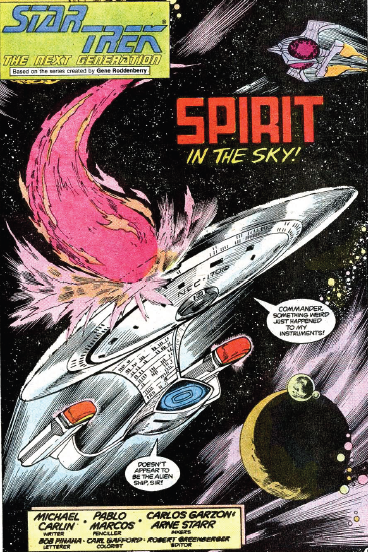 You can find this comic and many others on the Star Trek Comic Book Collection DVD (where our images came from for this post), or in the Trade-Paperback ST:TNG – Beginnings. It really is worth your time, the next three issues ask the question of what would happen if Q were human (several years before the series did). One of TNG’s biggest flaws was its sterilized view of the future, with cultural details like Christmas and Ramadan all stripped out, as if the future were too civilized for anything that wasn’t sleek and shiny. Picard reads Shakespeare, but nobody picks up a novel for fun. 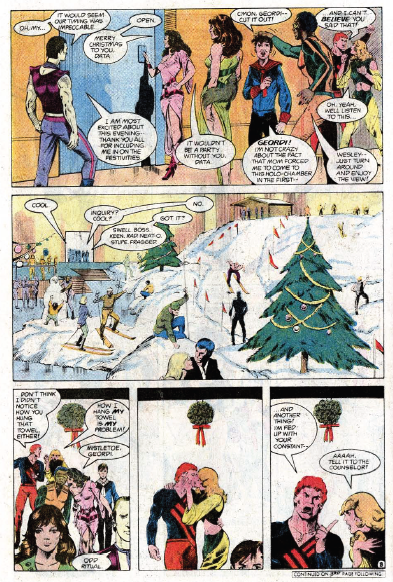 The Christmas scene in Generations was a major exception, and – not coincidentally – one of the best scenes in the movie.